There was a man named Simeon living in Jerusalem. He was a good, God-fearing man and was waiting for Israel to be saved. The Holy Spirit was with him and had assured him that he would not die before he had seen the Lord's promised Messiah. Led by the Spirit, Simeon went into the Temple. When the parents brought the child Jesus into the Temple to do for him what the Law required, Simeon took the child in his arms and gave thanks to God. Knowing that I liked to travel and visit new and different places someone in the family gave me a book entitled Unforgettable places to see before you die (Steve Davey, BBC Books). As the title suggests the author travelled around the world with a photographer and produced a beautiful book of places that, in his opinion, were unforgettable and worth visiting. If you were going to make a list of things to do and see before you pack your bags for the last time, the places mentioned in the book are worth considering. If you look around book stores or check out the internet you will find lots of advice on things you should do and places you should travel to before you die. One author had written a similar book with 100 things to do and see before you die and intended to do them all before he was too old to travel. However, he died at 47 barely halfway through his list. There was a man named Simeon. He had done everything he had wanted to do in life except for one thing – to see the Messiah God had promised in the scriptures. We are told that he was a good, God-fearing man who longed for the day when God would send the saviour. We are also told that the Holy Spirit had promised him that he would not die before he had seen the promised Messiah. Because Luke emphasises this fact we are led to believe that Simeon is now an old man and still waiting for that day when he would see God’s promise fulfilled. Maybe because of his advanced years Simeon knew that God would do as he had said very soon. We don’t know what Simeon expected to happen and I doubt very much that he was expecting a baby. One thing was clear there was still one more thing he wanted to do before he died and so we have this image of an old man waiting and watching, looking and searching for a sight of the Saviour. Mary and Joseph had bundled up their six-week-old baby boy and made the trip from Bethlehem to the temple at Jerusalem, where they planned to present their firstborn son to the Lord and make a sacrifice for Mary’s purification, as the Law of Moses required. Simeon is led by the Holy Spirit to the temple that same day. Maybe it wasn’t on his list of things to do that day but somehow he knew that going to the temple was what God wanted him to do. Since he had been promised that he would see the Messiah before he died, he couldn’t afford to ignore the fact that for some reason God wanted him to be at the temple on that day and a certain time. It seems strange that we don’t have any recorded conversation between Mary and Joseph and Simeon, but it seems the parents from Bethlehem sensed the deep spirituality of this old man with his outstretched arms asking if he could hold their child. Old Simeon sees in this tiny child the salvation that people have been waiting for. Here in his arms is the one who will save all people. Simeon says that now he had done all the things he had wanted to do in life and was ready to die now that he had seen the promise of God fulfilled. Cradling the infant Jesus in his arms, Simeon prays to God. And after he had blessed Mary and Joseph, he went on to tell them more. 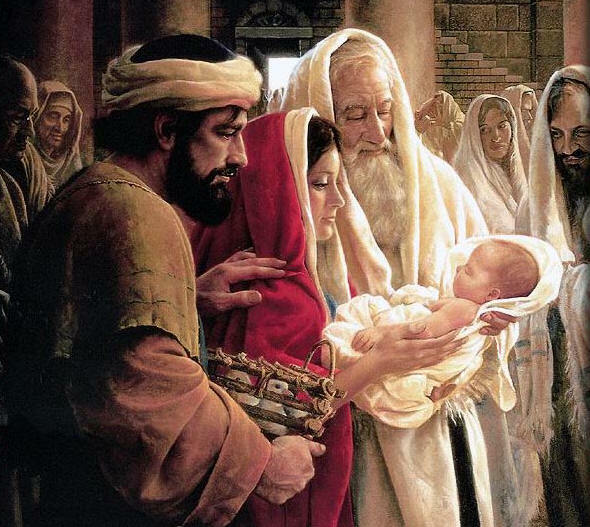 Simeon had described this baby as a bright light that will reveal God's will to all people. As you know the brighter the light the deeper and darker the shadows. Many people rejoiced to learn who Jesus was but there were also many who would clench their fists out of anger. The Saviour would force people to choose whether they really wanted to get close to God or not. He would expose those who didn’t. He would remind them that he and the Father are one and that to reject him would also mean rejecting the one who sent him. There will be those who will deny that he is the only way to be reconciled with the God of the universe and it is only through him that it is possible to enter into the Father’s presence in heaven. This child will cause a great divide throughout all humanity – those who will believe and trust him as their Saviour and those who will reject him and do their best to get rid of him. Simeon said to Mary as he passed the baby back to her, "This child is chosen by God for the destruction and the salvation of many in Israel. He will be a sign from God which many people will speak against". We know that throughout his life on earth and ever since this has been the case. Simeon didn’t know that Mary would see Jesus die on a cross but he did know that, when Jesus suffered rejection and humiliation, she would also suffer. "Sorrow, like a sharp sword, will break your own heart," Simeon said. There was a woman whose name was Anna; eighty-four years old, and she too was looking for and speaking of this Saviour who was to come. The Bible says that she never left the temple; she stayed there day and night, fasting and praying that one day she would see the One whom God had sent to redeem Israel. Again, God brought them together at the right time, and Anna prophesied that this child would redeem Israel. All her years of watching, waiting and fasting suddenly came to an end, as she told the people in the Temple who this child was. For Anna too her life was now complete. Of all the things that she had experienced in life, and of all the things she had achieved and done, this was indeed the most important and most exciting. Her list of things that she wanted to do before she died was complete. There are reasons why these two people are featured on the first Sunday after Christmas. The first is the irony that, while Simeon could not die until he met the Saviour in person, we cannot really live until we meet the Saviour. We can journey through life, happy enough, perhaps. We can be successful, and comfortable, and joyous people, but we cannot be at peace until we know that the Saviour has come to love us – one by one – love us into the Kingdom of God. Simeon’s joy was complete when he encountered the Saviour sent by God. Likewise our joy can only be complete when we encounter Jesus as our Saviour. He is not just a figure of interest from the stories of the Bible. He is our Saviour, the one who has been sent into our lives to drive out the darkness of sin and death and bring us the light of forgiveness and eternal life. It is only when we realise that Jesus came into the world for each of us personally that we can find true joy that will rise above any of the hurts and dangers that we will encounter along life’s path. Secondly, we see in these stories of Simeon and Anna, evidence that the religious life is not a brief sprint, as we sometimes presume, but it is a marathon. In an age of instant gratification, where the pursuit of a particular passion may last several weeks or months, these figures from the gospel of Luke spent many years seeking God’s blessing. In an age where religious fervour lasts as long as it makes people feel good, and when things are no longer exciting they go on to something else that will give them a buzz, these two elderly figures remind us that faith and trust in God, commitment and dedication to what God wants of us, and religious fervour and commitment to God's church is not a matter of a few weeks, months or even years. For us, waiting for next Christmas might seem like forever; for Simeon and Anna, their watching and waiting spanned many decades. I’m sure there were times when they must have been impatient with God, depressed about their fellow Jews and their misguided ideas of worship and how God should act, and wondered whether God would really carry out his promise of a Saviour, but none of that deterred them from hanging in there, trusting God and waiting for that moment when God would bless them and they would be blessing to others as they pronounced to one and all that they have seen the salvation that God had promised. In fact, they could describe to others what it was like to hold the fulfilment of God's promise in their arms. The third reason why Simeon and Anna feature straight after Christmas is that they bring us back to why there had to be a Christmas in the first place. We have seen the baby in the manger and heard the story about the angels and the shepherds. We have heard the ancient prophesies about the Saviour. Simeon and Anna remind us that God's plan of salvation will include cruelty, pain, torture, whips, nails, and dying. God has come to earth – this child is a light revealing God's love and bringing salvation for all people. He is our Saviour 24 seven, 365 days of the year for the rest of our lives. That’s something to get excited about. Jesus has come from heaven to earth for me – for you. Let’s take this Christmas joy with us into the New Year. Even if we should die this coming year, suffer illness or face various kinds of misfortune, we can have that deep down joy and confidence knowing that Jesus is Saviour. He is our light, our strength and comfort every moment of the year ahead and every day of our lives.